Managing a nonprofit organization takes patience, hard work, and above all, a lot of organization. From managing peer-to-peer fundraisers to properly marketing your organization online, there’s an endless number of things on your to-do lists. Luckily, there’s a software solution for every need you encounter. For everything from accounting to fundraising, there’s software ready to pick up the administrative load weighing you down. 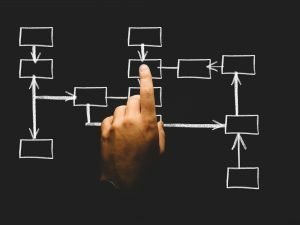 Read on to learn which software solutions can help your organization run smoothly and more efficiently! Take your fundraising to the next level with Qgiv's comprehensive suite of nonprofit software. 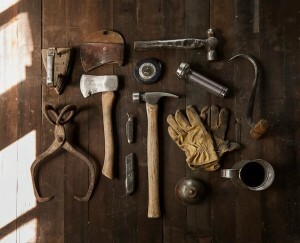 Qgiv offers all the tools your team will ever need to engage donors and raise more funds. See Qgiv in action. You can learn more about Qgiv by requesting a demo today. Qgiv’s nonprofit software is easy to use and adapts to your nonprofit, meaning it grows as you do! 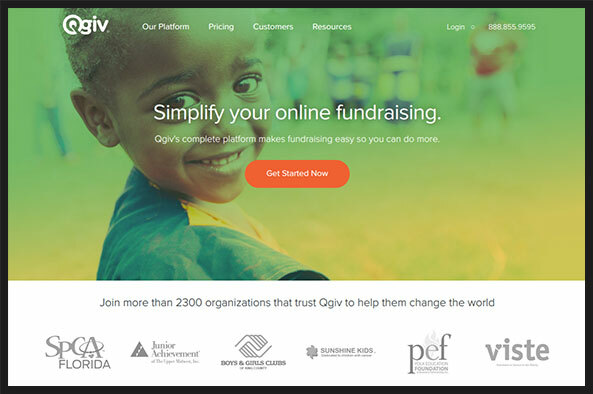 Qgiv offers nonprofits the chance to really engage and recognize their donors with customized and inspirational donation pages. Plus, Qgiv will help your organization focus on making the donation process as easy as possible. Send custom thank-you’s and receipts, and use their mobile giving, social sharing, and embeddable widget options, too. 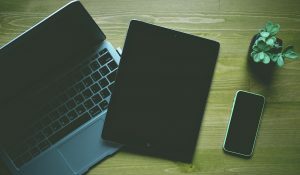 We’re obviously a little biased… but we do work really hard to make our software the best possible solution for nonprofit fundraisers regardless of their organization’s size. With Qgiv, there’s no need to worry about fundraising out of the scope of your software because your software will expand as you and your campaigns do. Qgiv has practically everything any nonprofit could need. From peer-to-peer fundraising solutions to giving kiosks, Qgiv has your back for fundraising and more! Check out Qgiv’s nonprofit software! DonorSearch’s wealth screening tools are stellar additions for nonprofits interested in donor relationships, retention, and stewardship. Advertised as having the “highest accuracy rate in the industry,” DonorSearch’s data is 70% accurate, which is as accurate as wealth screening data can be without manual verification. On top of that, their specialists will review as many records as your organization needs, bumping their accuracy rate up to 90%. With great philanthropic reviews, a prospect generator, daily screenings, and more, how can anyone say no to DonorSearch? Their prospect generator helps increase your donor base by finding new prospects who are already interested in your cause. Your results will include individuals who have given to similar nonprofits or causes. Aside from DonorSearch’s success rates, your nonprofit can receive unlimited training for your DonorSearch software. Contact DonorSearch for a quote on their wealth screening tools. Don’t forget to try out their free demo with a DonorSearch team member, too! 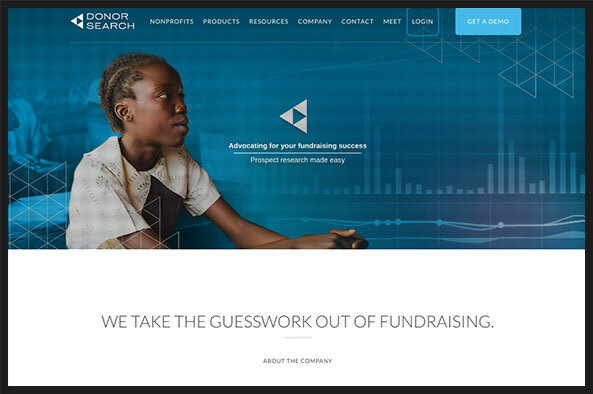 Check out DonorSearch’s nonprofit software! Double the Donation’s nonprofit software strives to help nonprofits maximize their donations through matching gifts. Matching gifts are part of a corporate program enabling companies to match their employees’ donations to eligible nonprofits. Unfortunately, only 1 in 10 eligible donors submits their request to have their donations matched, so nonprofits are losing out on contributions. 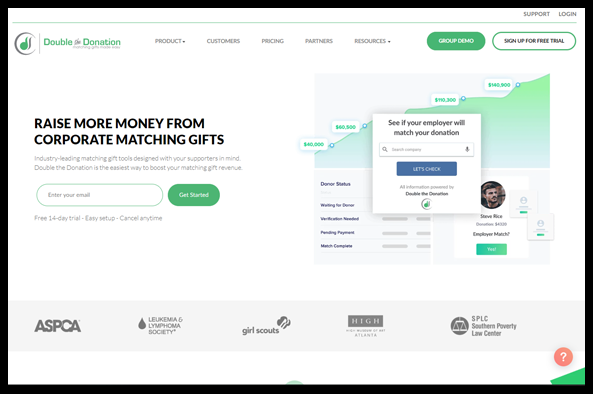 Double the Donation identifies eligible donors and then helps them submit their matching gift requests so your organization sees as much profit as possible. Double the Donation’s software includes a widget you can easily insert on your website or donation form. Their widget helps your donors easily identify their employer’s eligibility by typing in the company name. Double the Donation has worked with scores of nonprofits ranging in size from Ridgefield Library to the Leukemia and Lymphoma Society. From one-man shows to multi-officed organizations, Double the Donation holds furthering your cause by means of matching gifts at the top of their priority list. Check out Double the Donation’s nonprofit software! Bloomerang is a donor management solution whose focus revolves around creating stronger donor retention rates and strategic donor management practices. They have pooled together the industry’s various best practices to help nonprofits decrease donor attrition and increase their revenue. 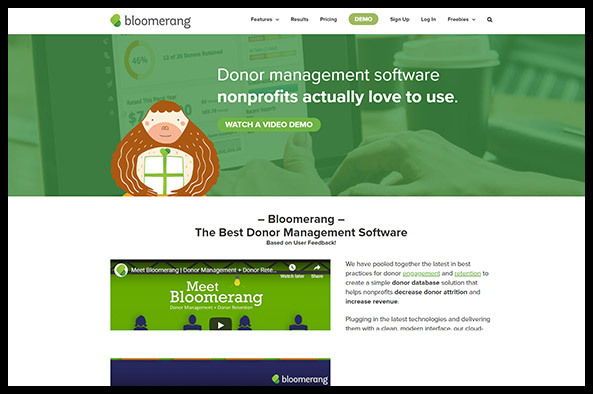 Bloomerang uses the latest technologies to present a clean interface and a cloud-based system and can help your nonprofit enhance its donor loyalty. Interactive dashboards. Review your donor retention rate and track your campaign’s success. Constituent timelines. Bloomerang’s timeline visually represents all interactions at both individual and organizational levels. Giving summaries. View a constituent’s past giving to your organization, and their current engagement level. Smart reports. Create comprehensive reports with just a few clicks! Bloomerang also integrates with Qgiv’s platform, which can help your nonprofit get an even more accurate picture of how your donor base is performing! Unlike other heavy-duty CRMs, Bloomerang doesn’t prioritize complicated customization capabilities. Instead, it relies on simple integrations to offer users the functionality they need. Lighter options are also available for smaller nonprofits just starting out. Check out Bloomerang’s nonprofit software! 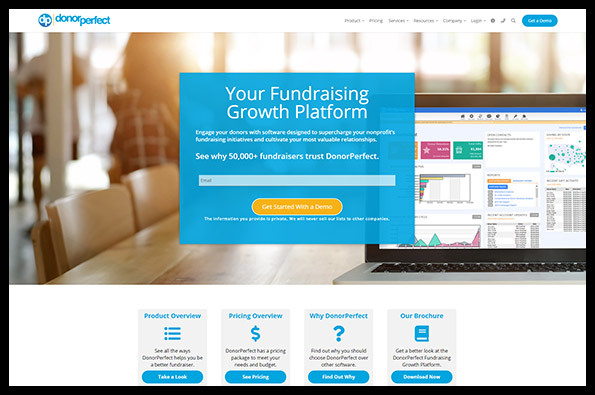 DonorPerfect is a donor management system (CRM) that offers tools to help grow your donor community and build your fundraising capacity. It’s completely customizable to the needs of almost any nonprofit type and allows you to manage your donor data and raise more money in the most effective way possible. DonorPerfect’s client services team helps you from the very first day, whether you want to learn a new feature, optimize your database, or just get started. Your specialist will get to know you and your organization so they can help you determine your next best steps in using the platform. Visit DonorPerfect’s pricing page to request a quote tailored to your specific needs. Check out DonorPerfect’s nonprofit software! ClearView CRM is a cloud-based CRM, fundraising software solution, and donor database. It’s easy to use on any device, and gives you the data and tools you need to grow constituent devotion. ClearView CRM is highly customizable and fully integrates with Qgiv’s platform. It also offers features like list segmentation and extensive reporting options, which can streamline efficiency for large organizations. 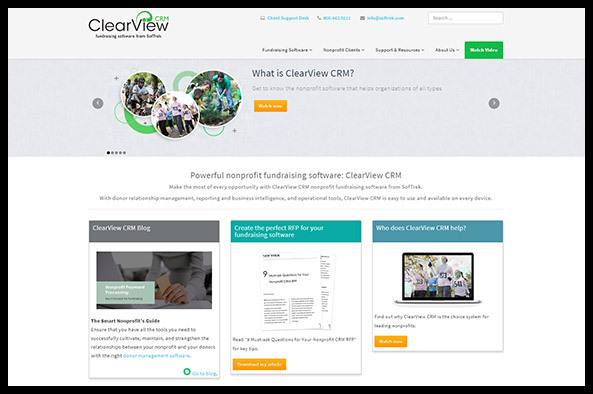 Contact ClearView CRM for a quote on their nonprofit software! Check out ClearView CRM’s nonprofit software! 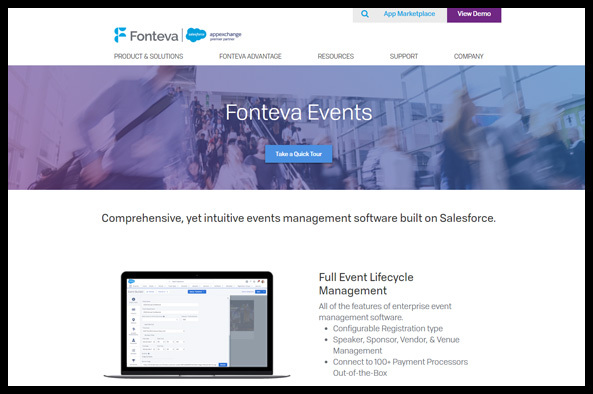 Perfect for nonprofits who are already using Salesforce, Fonteva offers easy-to-use, easy-to-integrate event management software better known as Fonteva Events. This cloud-based solution was built on Salesforce, so there’s no hassle to integrate software solutions. Perfect for any kind of event (multi-day, multi-session, etc. ), Fonteva Events can handle your most complex pricing rules for event tickets and your most simple announcements. It also has an intuitive event setup process that includes registration flows. Manage your speaker, sponsor, vendor, and venue details all in one central location, and connect with Fonteva’s 90+ payment processors to find the best fit for your organization. Event management. Use Fonteva’s event setup wizard and manage exhibitors, sponsorships, venues, speakers, and vendors. Attendee management. Create and access schedules, attendee agenda builders, and wait-lists. Advanced registration. Fonteva offers on-the-go registration, an advanced pricing engine, payment processing, ticketing, and more. Event marketing. Get access to mobile-ready event micro-sites and a customizable form launcher. eCommerce. Use Fonteva’s full revenue accounting, eStore, single shopping cart, order management feature, and online donations capabilities. Reports and dashboards. With an easy drag and drop report setup, there’s nothing your organization can’t report on! Fonteva is used by over 23,000 nonprofit organizations and higher education institutions and is built on Salesforce, making it a perfect fit for nonprofits who already use Salesforce. Contact Fonteva for a quote on their Fonteva Events solution. Check out Fonteva’s nonprofit software! 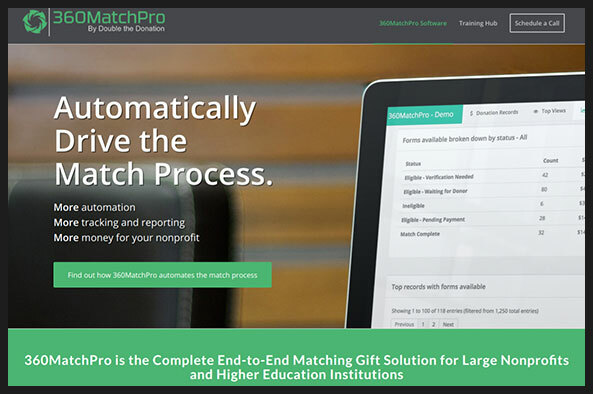 360MatchPro is the ideal nonprofit software for marketing matching gifts across multiple nonprofit channels. 360MatchPro states that they “automate the three essential components of a successful matching gift program,” which are automating identification across your fundraising, driving matches to completion, and creating actionable insights with next steps. Their software helps automate your outreach through triggered email reminders and sends one-off emails for personal approaches. 360MatchPro wants your nonprofit staff members to spend their time in the most beneficial and efficient manner, which is why they help you identify match opportunities as quickly as possible, update your documentation, and even track new donors! This software focuses on spreading the word about matching gift eligibility. With 360MatchPro, you can easily identify eligible donors through their email domains and configure automated matching gift related messaging for them. Contact 360MatchPro for a quote on their nonprofit software. Check out 360MatchPro’s nonprofit software! 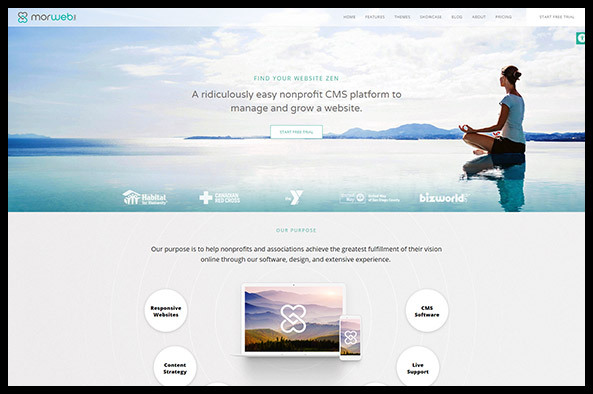 Morweb is a content management system built specifically for nonprofits and associations. It offers web design tools, as well as partners with a full-service web design agency. Morweb is intended for users without a technical or design background. No coding experience is necessary, and you can easily use the drag-and-drop frontend designer. This makes long-term maintenance easier, and nonprofits and associations can use the other built-in features meant for their market, such as online donations. Morweb also offers bulk pricing for larger organizations. Check out Morweb’s nonprofit software! Now that you have our top picks for nonprofit software, your organization will be running more smoothly than ever! Qgiv’s Peer-to-Peer Fundraising Guide. Interested in using Qgiv’s peer-to-peer nonprofit software? Check out the peer-to-peer fundraising guide before you begin for helpful tips and pointers! Qgiv’s Top Fundraising Software. Are you interested in learning about even more fundraising software solutions? Check out Qgiv’s list of the best providers. You’re sure to find what you need there! Online Fundraising Platforms: 12 Questions Before You Buy. When you’re in the market for an online fundraising platform, the process of researching is important and requires thought. Learn what you should ask yourself before investing. Double the Donation’s Best Accounting Tools. If you’re searching for more financial assistance for your nonprofit, check out Double the Donation’s top list of accounting solutions to find your perfect fit.